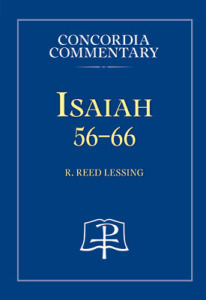 Dr. Reed Lessing's commentary on Isaiah 56-66 has received outstanding advance endorsements from the academic community. Read below what scholars are saying about the book! As with his earlier work on Isaiah 40–55, Professor Lessing has given us a highly useful commentary on chapters 56–66. More than many others, it nicely balances linguistic and grammatical precision, exegetical acumen, and profound theological insights. Without forcing the text to say what it does not, Lessing is able to give an unashamedly Christian interpretation which will be very helpful to Christian pastors and teachers. This is a welcome addition to the list of Isaiah commentaries and is much to be preferred over many of them. Reed Lessing offers a fresh theological interpretation of Isaiah 56–66, the often-neglected concluding chapters of the book. With rich exegetical detail, he demonstrates the continuity from Isaiah 1–55 to these chapters, showing how the latter bring the “righteousness” and “servant” themes to culmination and highlight the growing “communal rupture” which will lead ultimately to the split between Judaism and Christianity and the inclusion of Gentiles within the people of God. Though thoroughly familiar with contemporary historical-critical conclusions to the contrary, he confidently affirms the divine inspiration and Isaianic authorship of the entire book, as well as the non-postexilic setting and structural unity of its final eleven chapters. No other recent commentary so deftly integrates a consideration of the canonical context of Isaiah 56–66, their New Testament appropriation, and the fulfillment of the prophet’s eschatological vision in the first and second advents of Jesus Christ and the birth of the Church. Dr. Lessing’s philological and literary exegesis of the Masoretic text gives evidence of an extensive learning and familiarity with the multiple subdisciplines in contemporary research of ancient texts. Moreover, the commentary pays full attention to multi-layered connections of chapters 56–66 to chapters 40–55 (expounded in Dr. Lessing’s previous volume [CPH, 2011]). The immense field of earlier and recent secondary literature is taken into account and discussed in a summarizing, remunerative way. The author acknowledges the hermeneutical principle of “Scripture interprets Scripture” which has guided interpreters through the ages. Since he applies this principle both as an article of faith and as a practical mode of literary analysis, the book is entitled to a place among excellent reference works.